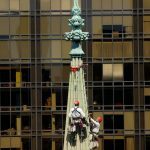 Over nearly a decade, Vertical Access has joined teams of architects, engineers, and conservators working to document, assess, and maintain St. Patrick’s Cathedral. 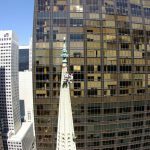 Vertical Access has performed both interior and exterior investigations of the cathedral, including inspection and documentation of exterior masonry at the west facade spires and gable (2004 and 2008) and investigation of attic trusses, rafters, and catwalks (2012). 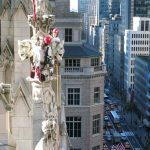 St. Patrick’s Cathedral is the largest decorated gothic-style Roman Catholic cathedral in the country and is the center of the Archdiocese in New York. The first cornerstone was set in 1858 and after a hiatus in construction during the Civil War the Cathedral was opened in 1879. The two towers on the west façade of the Cathedral were added in 1888 and the Lady Chapel and other work at the east end of the structure were begun in 1901. After an extensive renovation of the interior undertaken between 1927 and 1931, the Cathedral took the form and appearance that it essentially has today. 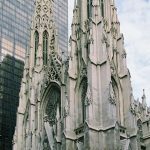 At least three different types of marble are used for the cladding of the exterior and the highly ornamental stonework typical of high gothic architecture. The 330-foot tall spires on the west façade are clad mostly in Cockeysville (MD) marble; marble from Tuckahoe or Pleasantville (NY) is used at the lower portions of the Cathedral including the west facade, and some of the recently replaced decorative elements on the west façade are carved from Lee (MA) marble. Surveyed existing condition of exterior masonry at the two spires and gable end on the principal (west) facade. Collected numerical data on existing conditions to assist others in the development of construction estimates, budge and work phasing plans and construction documents. Procured samples of possible original and replacement mortar from select locations. Examined and documented wood trusses, rafters and catwalks in attic of west end, determined member sizes and connection details of both truss types, and characterized bearing conditions of roof purlins.